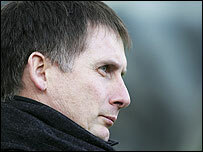 Newcastle chairman Freddy Shepherd is hopeful that he will be able to appoint Glenn Roeder as manager within days. Roeder, 50, does not have the required Uefa Pro Licence to take the job but Shepherd hopes to persuade the Premier League to relax that regulation. He has led Newcastle into the Intertoto Cup and Shepherd said: "Glenn has won the job, simple as that, end of story. "I am sure my fellow chairmen and friends will support us in what we believe is a just case for Glenn." Last Thursday the Premier League rejected Newcastle's request for dispensation to appoint Roeder as manager. But Shepherd has continued to lobby his fellow chairmen after the Premier League agreed to accept the result of a vote on whether or not Roeder should be allowed to gain the Uefa Pro Licence while in the job. Roeder had previously enrolled on the course when he was struck down by a brain tumour - and Shepherd is hoping that reason will help win the argument. Under Roeder, Newcastle have taken 32 points from the 15 league games in which he was in charge. He took over in a caretaker capacity in February following the dismissal of Graeme Souness and has led the Magpies to 11 wins in 17 games. Retired Newcastle captain Alan Shearer backed Roeder to succeed as Newcastle manager. "I hope he gets it because he deserves it," said Shearer. "When he took over in February, if everyone was honest, we were looking at the other end of the table. "Thatturnaround is a great credit to Glenn and to the rest of the players and he's worked so hard to get the club into Europe, he obviously wants a shot at it now, and rightly so. "He's got the bug, he's got that winning feeling."